Gorgeous views from Mahogany deck overlooking Wellfleet Harbor. 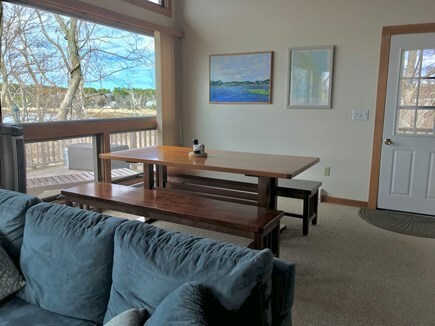 Living Room with unobstructed view of Wellfleet Harbor. Dining area with large trestle table with views of Harbor. Open floor plan with Dining area and Lliving room -Harbor views. 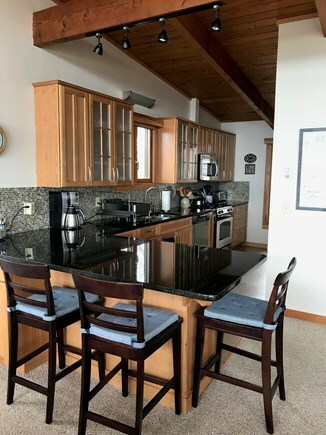 Chef's kitchen: Granite countertop, Dshwshr, Gas range and more. Bedroom #1: Master Bedroom with King bed. Bathroom #1 - Full bath, walk in tiled shower with handrails. Bedroom #2 with Queen Bed and views of Harbor. 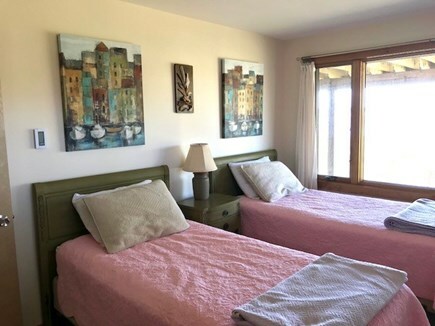 Bedroom #3: Two twins with water views. 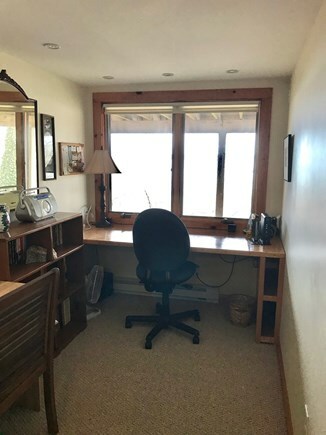 Desk and Study with Harbor views. Bathroom #2: Full bath with tub/shower combo. View of backside of house, with gently sloping ramp. Stunning sunset views from Mahogany deck. Beds: 1 king, 1 queen, 4 twins, One PacNPlay crib. 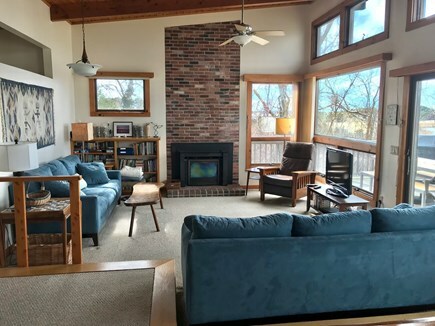 Located in the desirable Indian Neck area, this beautiful, spacious and contemporary home has SPECTACULAR views of Wellfleet Harbor, Chipman’s Cove and Wellfleet Village. This home is perfect for families with very young, or elderly members-and anyone in between! There are several Bay beaches within easy walking distance (0.4 miles) which boast fabulous swimming, sunning and beachcombing. Fox Island and Pilgrim Spring Conservatory Trails are nearby. 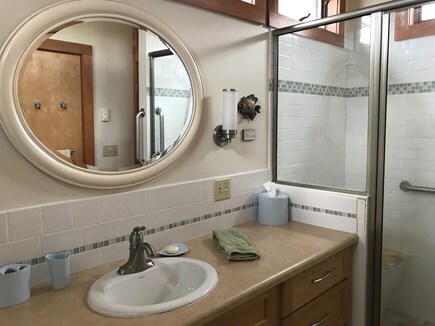 FABULOUS RENOVATIONS throughout the entire home - include new kitchen with updated appliances, renovated 2nd full bath and large, Mahogany deck – perfect for lounging and enjoying the warm summer breeze or dining el fresco while watching the fishing/pleasure boats in Wellfleet Harbor. 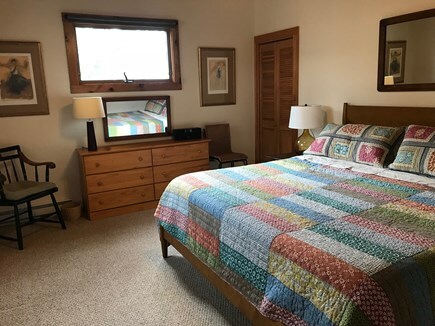 Four bedrooms: #1-Master with King bed, #2-Queen bed, #3-two Twins, #-4 two Twins. Separate study/office. 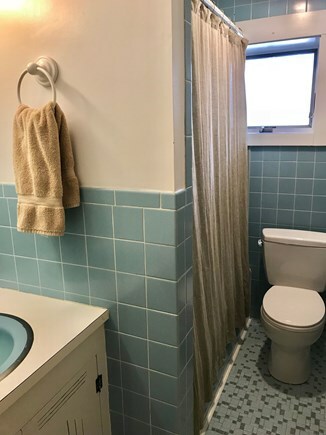 Two full baths and private outside shower. Stackable laundry on main floor as well as Large capacity, High Efficiency washer and dryer on lower level. We offer Exfinity TV cable service, as well as broadband wireless internet. We also have an abundance of beach 'stuff' - chairs, umbrellas, children's toys, floats, life preservers -which tenants may have use of. Upon request, I can offer a child's portable Graco 'pack n'play', bed rails,gates, stroller, as well as a booster seat. This house is very well stocked and equipped. With new renovations,this house is very accommodating for the elderly - please call for more info. if you have any special requests, please inquire. We've recently purchased a kayak, which renters may use AT THEIR OWN RISK. There are some lifejackets as well. *This home sleeps a maximum of eight, thus number in party must NOT exceed 8 (eight) persons. Additional pricing info: If renting more then one week,deduct $250 off total price. State and local taxes of 12.45% will apply. This house was renovated to accommodate elderly family members. There is a gentle, sloping ramp to access main floor, where Master and full bath with walk in shower are located. Stackable laundry also available on this level. Our family has genuinely enjoyed staying at this property. The entire house is well designed and very well maintained with comfortable furniture inside and out. The large deck overlooks the harbor and provides a constantly changing setting with some pretty skies at sunset. 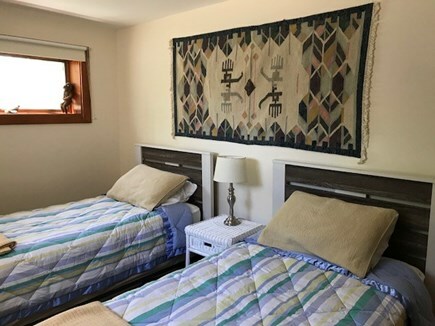 The location on Indian Head is convenient to several beaches within moderate walking distance, so short strolls give one access to various aspects of Wellfleet waters . Amazing views, great location, beautiful home. I have stayed in this gorgeous house before the renovations and loved it then, but now it is simply divine. The house is impeccably cleaned. The new bathroom is a work of art, the kitchen makes me envious I can't use it all year and the views speak for themselves. I can't wait to come back. This house has everything possible to create a fabulous vacation. 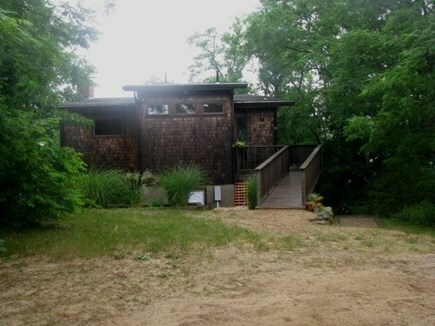 Everything about this vacation home is perfect for a family gathering in Wellfleet. The attention to detail was noted by everyone in our family -- with much appreciation for every amenity. My elderly parents didn't want to leave -- they loved the ease and beauty of the upstairs accommodations. This is a beautiful and lovingly cared for home with many welcoming touches. We can't wait to return. Thank you for all. This lovely, well kept and renovated property has been in the family for over 50 years. It was mainly used seasonally by the family. We have been renting our home for approximately 10 years and have many repeat renters who return year after year. 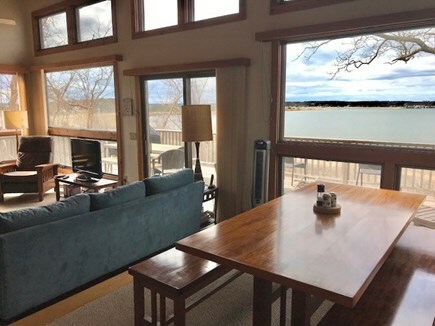 The views from this home are unparalled, with sweeping views of Wellfleet Harbor, and various landmarks in the Town of Wellfleet. Beach access, fabulous swimming and beachcombing is a 5 minute walk. We provide a variety of beach paraphanalia - chairs, umbrella, beach toys, life preservers, etc. We do have a kayak as well, which may be used at Renters OWN RISK. This is a wonderful property for families and friends, accomodating a maximum of 8 people. 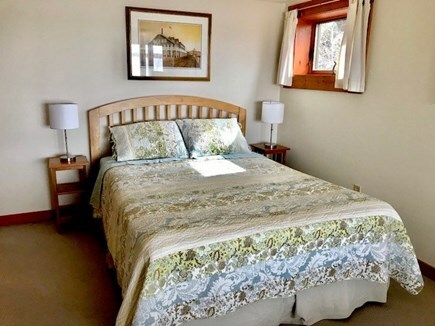 It is particularly appealing for the elderly - a gentle sloping ramp for access, master bedroom on main level, with a full shower that has a walk in shower and bench. There is a handheld shower nozzle, and numerous grab bars throughout bathroom. We also installed a smaller sized, stackable washer and dryer on this level for those unable to navigate stairs to the full sized, high efficiency washer and dryer that are located on the lower level. For the younger set, this property is set back from the road and there is a small, sandy area for outdoor playing. 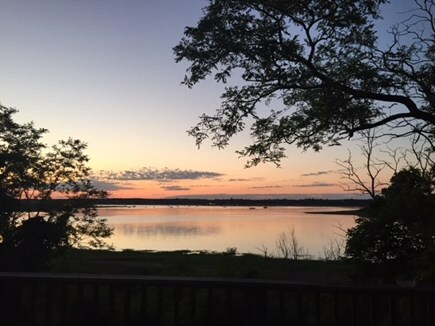 Wellfleet is uniquely characterized by its geography, culture and people. Located 75 miles out into the Atlantic Ocean, it's only 2 miles wide, with beautiful beaches on both the bay and Atlantic sides. Despite its narrow width, strangely enough, it's endowed with beautiful, clear spring-fed ponds, or kettle holes, which were created by glaciers several thousand years ago. 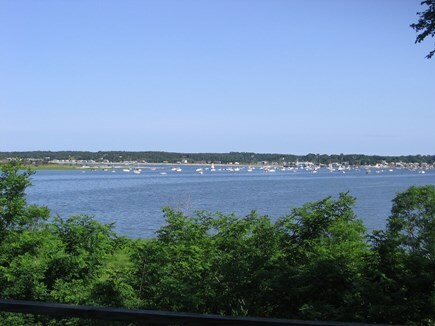 Today it is known as the ''Art Gallery Town'', as well as the source of world-famous Wellfleet oysters.